CityLife: Stories Against Loneliness | CityLife began life in 2014 as EastLife; an East London Civic Engagement research project at the University of East London. In 2016 we launched the pilot project CityLife, which spans more UK cities and expands on the groups of people that we work with. In 2018 we take that project forward, with new partners and a long-term community engagement plan. The CityLife team have been doggedly working behind the scenes to secure more funding for the 2018 new academic year and onward, to take our work into new universities and their respective communities across the UK. Wish us luck, and watch this space for more announcements of partnerships, plans and dates. The winner of the CityLife Prize for Fiction by Young Writers was announced at our yearly writing event, Write Now, on Thursday 18th May 2017. A huge congratulations to 17 year old Rebecca Hawkins of Brentwood School, who was handed her certificate and prize of £500 by our wonderful guest judge Salena Godden – a brilliant article on the evening was written by Kiera Hay at UEL, please read that here. Rebecca’s winning piece, London Calling, can be found here. We hope you all enjoy it as much as we did. We are thrilled to announce the ten shortlisted writers for the CityLife Prize for Fiction by Young Writers. Winner to be announced at Write Now, May 18th. We are pleased to confirm that our yearly event, Write Now, which celebrates UEL Creative Writing graduate work, will be held in UEL Stratford Square Campus on May 18th. There will be free refreshments and snacks, and we can’t wait to see everyone. Please book your FREE ticket via this link. This year, we will be joined by Salena Godden of The Good Immigrant, and Jacob Sam La Rose as our emcee. Salena is also our guest judge on the CityLife Prize for Fiction by Young Writers, and will be presenting the winner with their prize on the night too. Industry publication The Bookseller has very kindly given us a space on their site to talk about the CityLife Prize for Fiction by Young Writers. 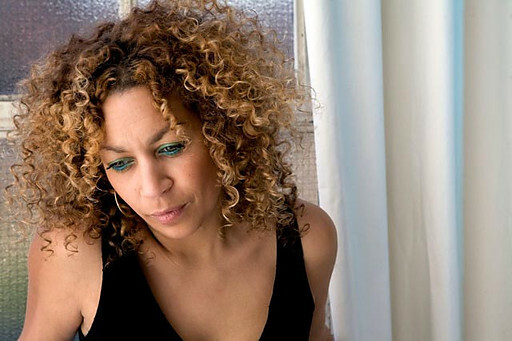 We are thrilled to announce that celebrated author and performer Salena Godden, whose dazzling poetry and prose have been performed on the BBC, published in an array of influential anthologies, and most recently in the best-selling The Good Immigrant, has agreed to be our Guest Judge for the CityLife Prize for Fiction by Young Writers. A ground-breaking spoken-word performer, Salena brings her astute ear and eclectic writing experience to our judging panel. Submissions for the prize have now OPENED. Get writing! Listen to Tessa & Stephen from the CityLife team, and Nicola, one of our student writers, being interviewed by the EastCast Radio Show about the CityLife Prize for Fiction by Young Writers (scroll down for more details on this). Click here to be taken to the EastCast website. In September 2016, the CityLife team and the University of East London announced the launch of a brand new and exciting literary prize, the CityLife Prize for Fiction by Young Writers. It is open to all London-based writers aged 16 to 19. For theme, entry requirements, prize details and more, please visit our dedicated prize page here. On this jam-packed and wonderful evening, we not only launched EastLife with an introduction from the editors Tessa McWatt, Stephen Maddison and Sam Dodd, as well as extracts from Jo Lazar & Craig Britton, but we saw the launch of The Gallion too, a student-led creative writing anthology, and heard work from graduating students Raisa Hassan, Charlotte Bone, Amir Aziz, Jack Pascoe & Justin Tuijl. The evening was hosted by the inimitable Jacob Sam La Rose, and our guest speaker was Linton Kwesi Johnson. See some wonderful pictures of the event on our Gallery page – credit and huge thanks to Roy Wilson for kindly giving his talent and time to take these for us. Thanks to all who came – especially the EastLife Writer team and our community elders! And a huge congratulations to Nicola Peard, Suzanne Wilson, Samuel Hardy, Jack Pascoe and Amir Aziz for coming up with the idea of selling the books donated to the Writing Centre by Pete Ayrton of Serpents Tail, to raise money for Richard House, the hospice we are working with in the second phase of the project which is now underway, CityLife. We’re very proud that they raised a whopping £170.27!! Amazing! Below, Shahina Haque of Richard House receives the (GINORMOUS) cheque. Only a few days left till Write Now! Book your tickets here. Write Now is an annual showcase event sponsored by UEL’s School of Arts and Digital Industries. It showcases Creative Writing at UEL, bringing the talents of creative writing graduates, staff and special guests to the wider community. 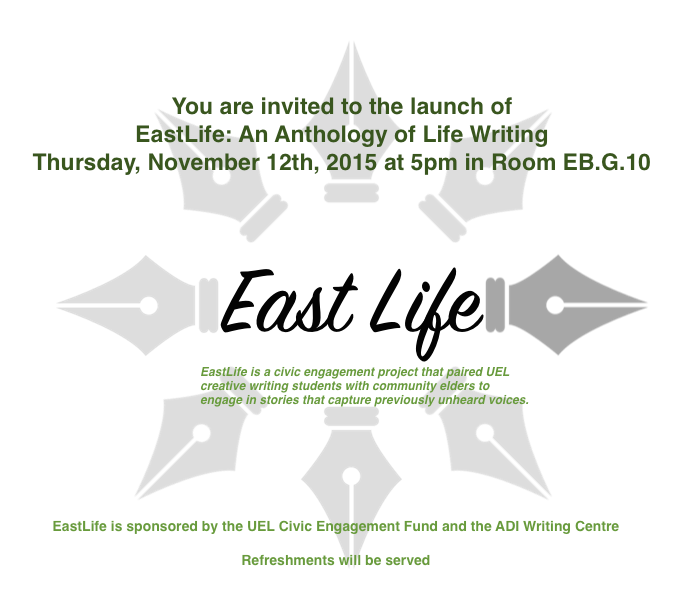 This year, we are also launching the publication of EastLife: An Anthology of Life Writing, an on-going civic engagement project, which paired UEL students with East London elders to tell their stories and produce autobiographical and biographical life writing pieces. The event will feature readings from this Anthology, along with readings from the new issue of The Gallion, our student-run creative writing magazine, published each year. Graduating students will be reading from a selection of their finest work. In addition, this year we have a very special guest: Linton Kwesi Johnson, who will be reading and in discussion with poet Tim Atkins. There will also be a Q+A with the audience. This event will be MC’d by Jacob Sam La Rose. Books will be on sale during the interval and after the event. Some proceeds of sales from EastLife: An Anthology of Life Writing will be donated to Richard House, a hospice for children with life limiting conditions. To book your tickets, please visit the Stratford Circus box office site. We look forward to seeing you. We’re very happy to say that we’ve now entered the next phase of our on-going civic engagement / creative writing project, which began life as EastLife, by kickstarting CityLife. We have four fantastic newly graduated writers working on the project with us: Nicola, Suzanne, Samuel & Jack. These students are interviewing parents and staff at Richard House, a hospice for children with life-limiting conditions in Newham. Stay tuned for more wonderful stories, coming soon. In March 2016 we visited Age UK in Bow, and Canning Town Library, to meet with all the community elders who took part in EastLife and present them with their books. Both occasions were incredibly rewarding, and we were able to read some of the pieces out. It was truly a pleasure to have worked with these incredible people. For pics, go here! The Books Have Come Off The Printer! We’re thrilled to announce that the first EastLife print run is complete, and we have in our possession a hefty hoard of beautiful books ready for our launch event in May, where we’ll be graced by Linton Kwesi Johnson and limitless third year creative writing talent. Please join us! Scroll down to our last post for more details. We are excited to announce that EastLife will be celebrated, along with UEL Creative Writing achievements by graduating students, on Thursday 25th May 2016 in Stratford Circus at 6.00pm. The event will be a celebration of Creative Writing & Civic Engagement at UEL. We have a feature slot from none other than Linton Kwesi Johnson, and are very pleased to also welcome Jacob Sam La Rose as the MC. We are launching our website, and the project officially, on Thursday 12th November 2015 at UEL. On this particular day, we were joined by the UEL Comms Team.